Footnotes from Room 104: The Year of the Mooster! 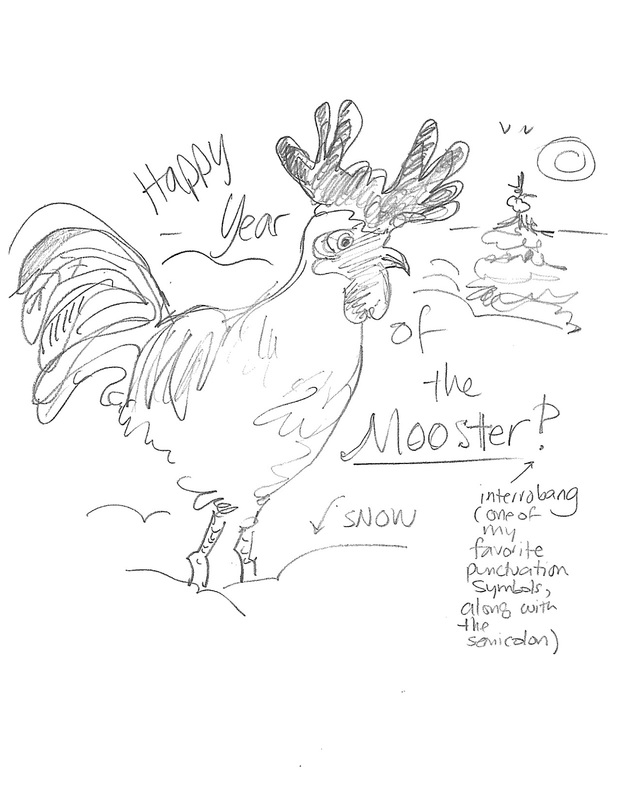 The Year of the Mooster! Welcome to nearly February! We've recently ushered in two new calendar years, of two different flavors. 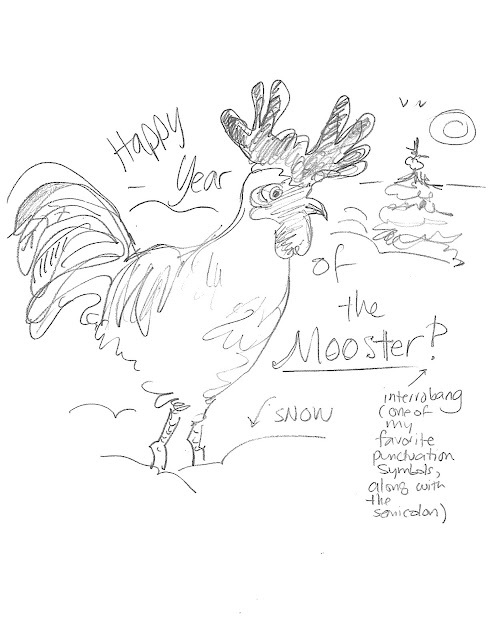 In attempting to draw a rooster, in honor of the Chinese Lunar New Year, I realized that I was rebranding it as a mooster! Cross-pollination seems so emblematic of what we do in GT instructional support that I decided to go with it! I hope 2017 and (and The Mooster) bring you and your family health and happiness ... and the chance to think outside the box. Below are notes about what each grade level has been up to lately. Thanks to the many of you who responded to a recent GT survey that Bob Gross and I crafted. It's clear that informing you on particular units and activities needs to be more of a priority! 4th graders have been focused on individual writing work, including hammering away at my 1970's manual typewriter. The recent Spirit Series stole some of my students away for a few weeks (alas, the snow day eclipsed my chance of SEEING these fine productions!). The two remaining students worked on Letters About Literature, a National Humanities Council contest about how a book changed ones life. We sent these letters also to the authors of these books. Guess what? Soman Chainani wrote back! As usual, we do plenty of word game warm-ups. Starting this week, we'll have the full group back and will venture into that classic wordplay of a novel, A Phantom Tollbooth. Will Rhyme and Reason prevail? 5th graders meet in two different small groups, and they do slightly different things. From inventing their own schools, complete with sorting-hat sorts of activities to determine "houses," to reading and discussing short stories, to working on creative NON-fiction (in honor of their classroom focus on the essay), the periods pass very quickly. As usual, I am able to see more of those students pursuing and sharing their own creative writing as we meet "on the doc" and outside of time, somehow. 6th graders, in honor of our ongoing "evolution of language" unit, have recently read the famous "All the World's a Stage" soliloquy from Shakespeare's As You Like It. At the moment, we are are reading Amy Tan's amazing short story about an young Chinese chess prodigy. The Rules of the Game has so many relevant themes, from immigrants to geniuses, dealing with parents to strategizing about longterm outcomes. 7th graders are in the middle of reading Karen Hesse's brilliant book, Witness. It takes place in the 1920's in a small Vermont town. What happens when the KKK comes to town? We're doing this piece as readers' theater and the tone and discussions are highly expressive. This comes on the heel of a poetry focus and, as always, many word game warm-ups. So long as man remains free, he strives for nothing so incessantly and and so painfully as to find someone to worship. These are just thumbnails of projects. How I wish you could be a fly on the wall! Please do be in touch if you'd like more specific information on the instructional support your child receives. Note below: GT Instructional Support below Gr. 4 and above Gr. 8 does not generally feature any pullout groups. I see all 2nd graders during "Second Grade Hour" and offer "Challenge by Choice" to all 3rd graders. Individual high school students may do independent studies with me, pending administrative approval. Please see our website for more details, or if you have never visited and are curious about resources! Just click on Chapter 104 - GT in the middle of the I.S. line-up. On a final note, I'm delighted to announce that I just landed a book contract with Scholastic for a picture book, currently titled Elba & Norris (and field tested, last year, on the entire third grade). I'm particularly delighted since my 13th book contract comes after years of various projects and rejections. I feel fortunate to work in an environment that cares so much about writing and that believes so truly in fostering grit. I'm very glad that I did not give up on not giving up! The book won't be illustrated by me (oh well) and isn't due out until the spring of 2019. (These things happen in glacial time.) Still, I am frolicking! May joyful things happen to you all!